Definition: Sarcoidosis is an inflammatory disease that results from a specific type of inflammation of tissues of the body. The disease usually begins in the lungs, skin, or lymph nodes. Less commonly affected are the eyes, liver, heart, and brain. Any organ, however, can be affected. Sarcoidosis may be triggered by our body’s immune system responding to foreign substances, such as viruses, bacteria, or chemicals. 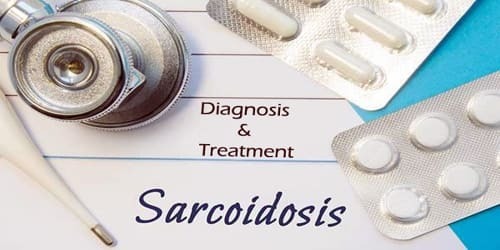 The word “sarcoidosis” comes from Greek (σάρκο-) sarcο- meaning “flesh”, the suffix -(e)ido (from the Greek εἶδος -eidos [usually omitting the initial e in English as the diphthong epsilon-iota in Classic Greek stands for a long “i” = English ee]) meaning “type”, ” resembles” or “like”, and -sis, a common suffix in Greek meaning “condition”. The cause of sarcoidosis is unknown. The disease can appear suddenly and disappear. Or it can develop gradually and go on to produce symptoms that come and go, sometimes for a lifetime. Some people appear to have a genetic predisposition to develop the disease, which may be triggered by bacteria, viruses, dust or chemicals. Diagnosis is partly based on signs and symptoms, which may be supported by biopsy. Sarcoidosis may resolve without any treatment within a few years. However, some people may have a long-term or severe disease. 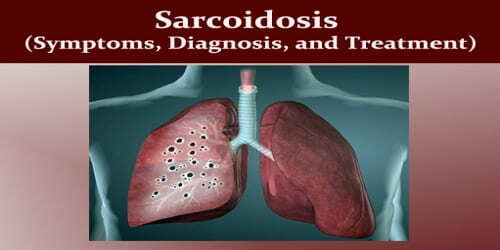 Signs and Symptoms of Sarcoidosis: Signs and symptoms of sarcoidosis vary depending on which organs are affected. Sarcoidosis sometimes develops gradually and produces symptoms that last for years. Other times, symptoms appear suddenly and then disappear just as quickly. Common symptoms, which tend to be vague, include fatigue (unrelieved by sleep; occurs in 66% of cases), lack of energy, weight loss, joint aches and pains (which occur in about 70% of cases), arthritis (14–38% of persons), dry eyes, swelling of the knees, blurry vision, shortness of breath, a dry, hacking cough, or skin lesions. Occasionally, sarcoidosis can lead to nervous system problems. For example, sarcoid granulomas can appear in the brain, spinal cord, and facial and optic nerves. Symptoms can appear suddenly and then disappear. Sometimes, however, they can continue over a lifetime. 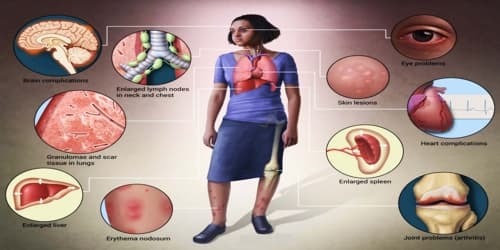 Diagnosis and Treatment of Sarcoidosis: Sarcoidosis can be difficult to diagnose because the disease produces few signs and symptoms in its early stages. When symptoms do occur, they may mimic those of other disorders. To exclude sarcoidosis in a case presenting with pulmonary symptoms might involve a chest radiograph, CT scan of the chest, PET scan, CT-guided biopsy, mediastinoscopy, open lung biopsy, bronchoscopy with biopsy, endobronchial ultrasound, and endoscopic ultrasound with fine-needle aspiration of mediastinal lymph nodes (EBUS FNA). Eye exam to check for vision problems that may be caused by sarcoidosis. There’s no cure for sarcoidosis. However, symptoms often improve without treatment. The doctor may prescribe medications if the patient’s inflammation is severe. These can include corticosteroids or immunosuppressive medications (medications that suppress their immune system), which can both help reduce inflammation. Most persons (>75%) only require symptomatic treatment with non-steroidal anti-inflammatory drugs (NSAIDs) like ibuprofen or aspirin. An organ transplant may be considered if sarcoidosis has severely damaged our lungs, heart or liver.